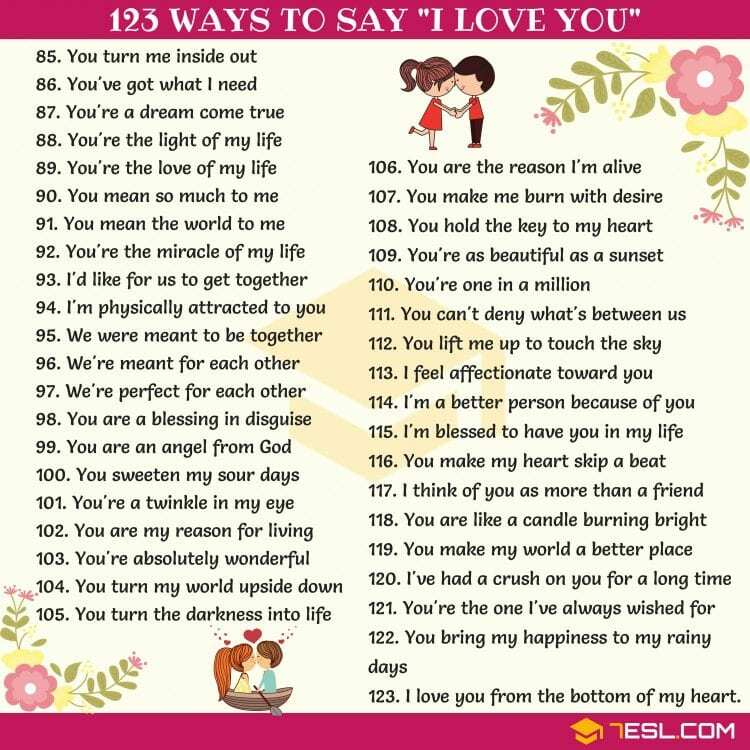 Telling someone you love them may be the most important moment in your life. You might do it on the spur of the moment (spontaneously) or you might be planning it for days. Or weeks. In case you’d like to choose your words carefully, here’s a list for you to help you. I’ve got feelings for you. 16. I’m all about you. 17. I’m smitten with you. 18. You turn me inside out. 19. Every time I see you, you leave me breathless. 20. I love you to the moon and back. 21. I just want you by my side always. 22. You make life worth living. 23. You got me. You got me good. 24. I don’t know why, but I can’t stop thinking about you. 25. You make me a better person. 26. I want you, and only you. 27. I fell in love with you over and over again. 28. You are the only one on my mind. 29. I have never felt this right with another person. 30. Imagining life without you is impossible. 31. You make my heart warm and happy. 32. You’re the light of my life. 33. I will support you through the good times and the bad. 34. You are the only one on my mind. 35. I love you more than any word can say. 36. You make everything feel possible. 37. You are the person I want to spend my life with. 38. You’re the peanut butter to my jelly. 39. As long as I have you in my life, I’ll be okay. 40. I will always be here for you. 42. You mean so much to me. 43. I’ve got a crush on you. 44. You are the object of my affection. 45. I’m out of breath for you. 46. You are a light of my life. 47. You are my sunshine. 48. I’m lost without you. 49. You make my heart skip a bit. 50. You rock my world. Next articleWhat is the subject & predicate in “Bring your homework tomorrow” sentence?